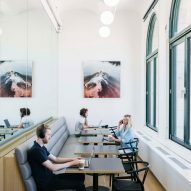 Instagram has moved into a workspace in New York City by Frank Gehry's architecture firm, where employees and visitors can make use of a soundproof media studio and snap photos with various backdrops. The image-sharing company has taken over the top floors of 440 Broadway, the old Wanamaker's department store close to Manhattan's Astor Place, where its parent company Facebook also has offices. 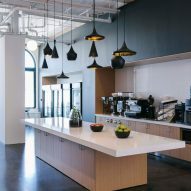 The offices act as Instagram's second major hub, after its headquarters in San Francisco. The company – launched in 2010 – first opened a New York office with three employees in 2015, and now has 290 people working in the city, with plans for further expansion. "When we started eight years ago, we were in a tiny little office," said Instagram co-founder Kevin Systrom during a press event at the space. "As we grew we started to realise that craft was a big part of what we did, not only building out product, but building our space and building our team." Los Angeles-based Gehry Partners was responsible for the layout and structural elements of the offices, and worked with an in-house design team on the interiors and installations. Making use of an expansive floor plan, high ceilings and large windows, the team created a sequence of spaces around a central atrium. Several moments are unsurprisingly intended to provide photo opportunities. 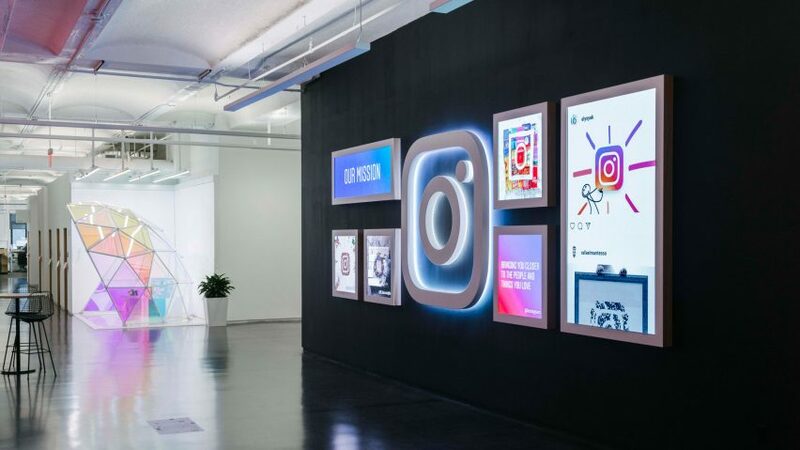 At the entrance is a digital greeting wall, which presents a rotating selection of imagery from the Instagram feeds and stories of the app's over 800 million users. Along a corridor can be found a partial geodesic dome made of dichroic glass, which changes colour depending on the angle it is viewed from. User-controlled lighting and moveable seating underneath the canopy make this an ideal spot for selfies. A wall covered with a coloured gradient and a green wall beside the staircase are also intended as backdrops for photographs. "Around the space you'll see artworks from our various community members, and we've integrated them into the space seamlessly to really represent that this is an art company," said Systrom. The public spaces are located along a central axis, which connects open-plan desk areas on either side of the building. In the centre are places for grabbing food, with choices ranging from a juice and a gelato counter "inspired by 1930s Cuban-Miami aesthetic", to a fully stocked bar called Thirsty Flamingo that is decorated with peach-coloured surfaces. A library space is intended for informal but quiet working, away from the workspaces at the east and west ends. Several private meeting spaces are also offered, along with a soundproof studio for recording audio and filming interviews. 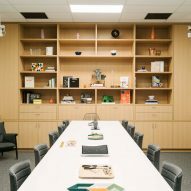 Conference rooms are named after popular Instagram accounts and search terms, including Accidentally Wes Anderson, Old Fashioned, Rainbow Bagel, Blair Waldorf, Rich Dogs of Instagram, and All Black Everything. "It's so special to be able to come into a space that is truly Instagram; that's crafted and special," Systrom said. Instagram's impact on architecture and interiors has grown considerably since the app launched in 2010. Earlier this month, architect Farshid Moussavi told Dezeen that clients are now asking for projects to have strong Instagram appeal. 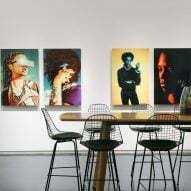 The company's co-founder Mike Krieger also said that he has noticed that the platform is influencing interior design. 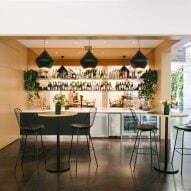 A recently released design guide aimed at architects encourages them to make Instagram-friendly elements a central part of their designs for hotels, bars and restaurants, to boost their chances of success. Photography is by Jonathan Pilkington unless specified otherwise.